By Nadine Nelson of Global Local Gourmet. The sixth principle of the Nguzo Saba relates to building and developing of our creative potential. KUUMBA (KOO-M-BAH) means CREATIVITY in Swahili. The secret to creativity in the kitchen is improvising dishes with whatever you have on hand. A treasure trove of culinary genius can be had by the black cooks that lead kitchens throughout history with our culinary lineage marked by “seconds, leftovers, what’s left, offal, and less than ingredients;” limited only by their imaginations that used constrictions in the pantry to become unexpected triumphs on the plate. The cult of domesticity and the space of the kitchen for Blacks, especially for African-American women as culinary historian Jessica B. Harris says “Black people have been in the room, but for so long they were so good at being invisible that they were easy to leave out of the historical record.” The kitchen has been a space of servitude and scarcity, and sometimes violence, yet a place of comfort, shelter, creativity, commerce and fellowship. In Colonial America, England, and many of the kitchens ran by cooks of the African Diaspora throughout time, Culinary Historian, Michael Twitty, asserts “Every household had their own version on hand, a mysterious spice blend, often a blend of dried ginger, bay leaf, allspice, mace, dried parsley, and salt, that what food lacked in cooking time, it gained in flavor from marinating overnight in kitchen pepper.” Condiments and spices mixtures personify creativity of people of the African Diaspora in the kitchen because they enhanced and heightened the food of cooks and allowed them to signify their style with special “spice, seasoning, sauce, preserve, or pickle… relish,chow chow, piccalill, and chutney.” All these concoctions that comprised the bulk of a larder that not only preserved vegetables from the garden for the colder months, they added flavor and spice to a meal. Which family doesn’t have those craved recipes like your Aunt’s special bbq sauce, a cousin’s hot sauce, or your grandmothers seasoning dust? kitchen is a space for community time, of shared lives and of communal intimacy. A nourishing environment,like the womb, the kitchen it is the perfect environment to nurture creativity. “To do always as much as we can in the way we can in order to leave our family and community more beautiful and beneficial than when we inherited it. It involves both aesthetic and material creations. It is essential that creativity be encouraged in all aspects of African American culture. It is through new ideas that we achieve higher levels of living and a greater appreciation for life. Each family member should find creative things to do throughout the year that will enhance the family as a whole.” On this day and as often as your can, listen to music, have your elders share food memories and recipes with you, cook together, it is a revolutionary act, plan a garden, draw, watch an independent film like “Daughters of the Dust”, “Soul Food Junkies”, “Sankofa”, dance, drum, sing, take pictures, write, recite, make edible gifts, and be creatively you. Happy Kwanzaa! Drawing from the tradition of the all purpose seasoning mix from the Brazilian state of Bahia is a blend known as Tempero Baiano in Brazilian Portuguese, with the Creole seasoning of Louisiana with their French, Spanish, West African, Amerindian, and Italian influences and the Colombo of the French Caribbean and the Curry of the former British Isles; this mix is a tribute to the female cooks that have made memorable meals without accolades. Oshun or Oxum as she is called in Brazil is the African goddess of beauty, love, prosperity and fertility. She is known for her cooking skills and being a fine gourmand. Oshun is well loved by her devotees all over the world. According to the Yoruba elders, Oshun is the “unseen mother present at every gathering,” because, in Yoruba, Oshun is the cosmological forces of water, moisture, and attraction. Therefore she is omnipresent and omnipotent just like the kitchen has long been assigned to the woman and is the central love of the home. This spice mix honors the memories of our culinary griots that journeyed with our heritage preserving, sharing it, allowing us and our traditions to continue to thrive. Combine all ingredients and place in an airtight jar or plastic container. In the tradition of using what one has available, in Boston they have public orchards where you can pick fruit for free. Roxbury Russets are pretty ugly and because they are organic they are the farthest thing from looking like conventional fruit. They are great for cooking and I came up with this savory recipe to use up all my free apples I am able to forage. Chutney is original to India. I am Jamaican and seasonal chutneys are a great way to use of excess fruit and vegetables. Combine all ingredients in a large pot. Simmer until thick. Stir frequently to prevent sticking. Ladle hot chutney into hot jars, leaving ¼-inch headspace. Remove air bubbles. Adjust two-piece caps. Process 10 minutes in a boiling-water canner. Walkerswood: Tucked away in the hills of St. Ann, Jamaica – Walkerswood Caribbean Foods has worked to bring a taste of the Caribbean to the world with an innovative line of traditional seasonings, cooking sauces, spices, preserves and canned vegetables. 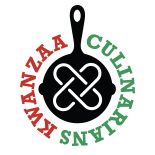 This entry was posted on December 31, 2015 by Kwanzaa Culinarians in 2012.